Just a quick reminder you have until midnight EST to get you photos of “who or what you love” on to Instagram to qualify for the flyaway getaway! That’s just under 90 minutes from right now! Don’t forget to hashtag #bklovesmayer ! It’s a great contest & supposedly John Mayer is choosing the winner himself! Here’s the set list for the Jones Beach Theater. 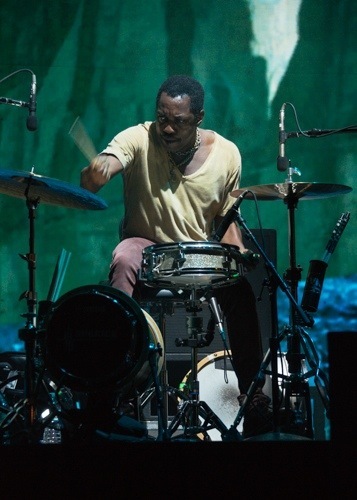 Steve Jordan, who is the drummer for the John Mayer Trio made a special appearance & played with John & the band. Unfortunately, we tried to get there, but the powers that be wouldn’t have it. Bethel Woods, NY was our 4th time seeing John Mayer in the last 2 weeks! Of course he was excellent as always! He kept his banter to a minimum as has been his recent practice, but he definitely appeared to be “in the zone.” He seemed to be in great spirits as would be expected with all the history of Woodstock surrounding him! The gods of rock must have been smiling down on him. He certainly seemed more connected with the crowd than at our previous show in Darien Lake. Affect wise, he seemed to be an almost different person! Paradise Valley was released today! Did this possibly have something to do with John’s apparent positive vibe? Perhaps, or perhaps our handsome young minstrel is a tad bit moody and tends to wear his emotions on his sleeve? I suppose moody and emotional are good qualities if one is to be troubadoring (I am well aware this is not a real word, but guess what? 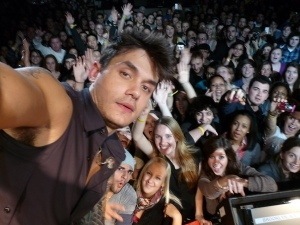 It is now in the ChasingJohnMayer dictionary) around the world enticing young ladies (and old ones too!) Therefore, I have decided to absolve Mr. Mayer of his sin of moodiness from time to time so long as it is not all the time! If you’ve never been to a concert at Bethel Woods and you have the opportunity it is a great place to see a show! It’s well taken care of with very nice landscaping & comfy, roomy seats. Next to the DTE Energy Center in Detroit it was the nicest of the theatres we’ve been to thus far. There were as is expected a few things that kind of sucked. First off it’s a super long walk from just the entrance to the amphitheater. Thank God we paid for the VIP parking! Loads of venders and concession along the way make the trip down the hill to the seating area not such a bad trek, however, once the show is finished and you’ve danced all night and then you’re having to make the journey back up the hill is when one might ask, WTF was I thinking? lol Even that wouldn’t be so bad, but lets not forget I’m hobbling on a seriously injured knee. The smoking section is limited so after the show was over I walked up to the designated smoking area and parked my fanny b/c I was in need of a nicotine fix and was chased away by the security people and I’m not even sure why. It wasn’t like we were loitering for 2 hours. oh well! That reminds me of another issue. The staff, now I’m talking about the ones with the “event security” shirts on, they don’t work for JM, they work for the venue and at every show I’ve ever been to in my life these people seem so miserable! The ones up there at Bethel Woods had to be the worst! I have no doubt that constantly redirecting people back to their seats and out of isles does get old, but if you’re a music lover wouldn’t you at least enjoy the music, the idea of being so close to the musicians? To me personally, this would be an awesome job!!!! If you’re not a music lover why would you even have a job like that? The only happy “employees” were the old volunteers. The museum itself is staffed with volunteers and runs off donations. In random areas were the (most often times) elderly volunteers who you just know were at Woodstock back in 1969 were so friendly and welcoming! They were great! It’s too bad the rest of the staff wasn’t so enthusiastic! By the way the museum is great too! Now with all that said and done the music was fantastic! Always is, but (and isn’t there always a but?) John we wish you’d change it up a little more. We completely understand that you’re anxious to play the new stuff and we’re glad to hear it, but there are so many different new and old songs we’re all dying to hear. It does seem JM’s falsetto has been returning a great deal just in the couple of weeks we’ve been seeing him. He makes it a point to “show off” a bit of it while he’s playing. So why then not change it up some? There are several songs off Born and Raised that we never hear: Whiskey, Whiskey, Whiskey, Walt Grace, Shadow Days. And why John are we always hearing Slow Dancing, Who Says, Waiting on the World to Change, Half of My Heart, I Don’t Trust Myself, Gravity, and Vultures? (Vultures, Gravity, & Slow Dancing are a few of my favorites), but there are sooooooo many more to choose from! Morgan and I continue to run to the tour app every morning to see the setlist from the night before and it appears that when he does throw in something different it’s always at a show we didn’t see! How incredibly frustrating!!!! 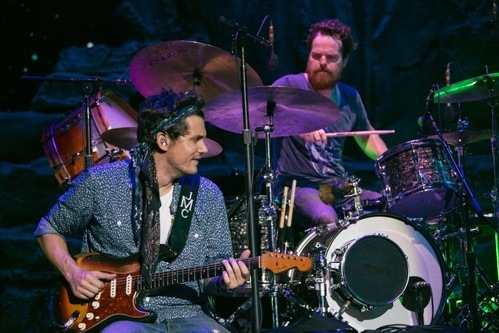 We love anything JM plays, but it be cool to hear him change it up and really go crazy some night! On a side note, we didn’t have the best seats for this show. We were very far off to the right side of the stage so no good pics or videos, but at one point when everyone was quiet Morgan let out one piercing, tumultuous scream. It just happened to be at the right time that it made it sound that much louder and believe it or not John Mayer himself even commented on that yell! lol So far we’ve done pretty freaking good at getting his attention in some way or another at most of the shows, but this was just hilarious! Everyone around us turned to look at her! Well everyone that didn’t leave because they were pissed that we were standing up dancing. What douchebag goes to any concert, sits in the 4 row and doesn’t expect the people around them to stand up?!?! That part kind of made me angry! All in all it was another smashing performance by all involved! Unfortunately, it doesn’t look like we’re going to be meeting John Mayer. He doesn’t seem to be socializing with fans very much. Maybe he’ll be out and about at the Allentown Fair on the 27th? We can only hope and pray!!!! Tomorrow we’re off to Camden, NJ! (after I get an MRI done on this knee) We can’t wait!!! Each one is just as fun and exciting as the first time! What’s going to happen on August 28th comes? We won’t know what to do with ourselves! So excited I could barely get any sleep last night! Ugh. 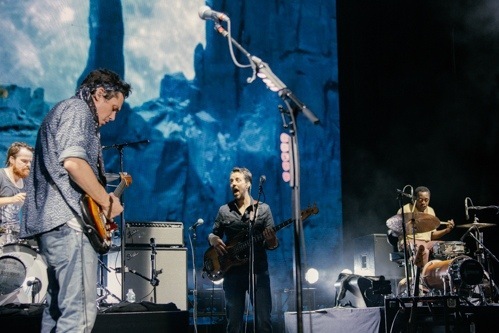 Today is our 4th John Mayer show! We’re half way through our chase with no signs of actually meeting John Mayer which stinks, but we’re having a great time! Hope everyone got a chance to see JM live on Letterman last night! He put Ina terrific show!!!! I had no idea he was going to play that long. My only real complaint was the crowd! How boring were they? Morgan and I were like, “WTH is wrong with that bunch of deadbeats?! ?” We were more into at home than they were to be seeing him live (and for free!). Today we’re off to Bethel Woods, NY. You know, where Woodstock was held!!! Should be some fantastic vibes up there! Lots of “Rock Gods” looking down to bless those who play there! No doubt in my mind its going to be phenomenal!!!! Think we might leave a bit early & hit the museum before the show! It really is an awesome place. If you’ve never been there & are close I highly suggest it! The museum runs on donations!! It’s an amazing part of music’s history!